Thats how it feels when everywhere you turn there are victims of some rapidly spreading phenomenon that leaves dispair and suffering in its wake. Here in Lisbon the headlines read “Nation Reduces Its Deficit By 22%” with a sort of pride; the demands of the global bankers are being met. But if you flip the pages of the newspaper, talk to the taxi driver, or the women on her way to work in Lisbon this morning, you’ll hear the painful details: Energy company privatized, raising prices by 30% next year. Most salaries in public and private sector slashed by 8% and higher. Elimination of holiday pay, a yearly bit of income most mid and low income families count on to get by. Government programs for career development, cut. – Everywhere you look it is the average citizen, who for decades has survived on one of the lowest wages in Europe, that now literally pays to get the government out of its massive financial hole. Somehow the bankers, governments, and many citizens in the rest of Europe will call it a success if Portugal manages to keep reducing its deficit. Many of the same people who, over the past decade, helped plunge the country into its current crisis. The government in Brussels and here in Lisbon will probably pat itself on the back when the good numbers are announced in a few months or (more likely) years. But what is left of a nation when everything has been cut or sold, and people have been squeezed to a breaking point? I digress, this is not supposed to be a list of what does or doesn’t need to be done to save Portugal or save the Portuguese economy. This is an open question about the working of the global and European economy. About how we measure what is good and what is bad. While government and financial leaders act as if this is the medicine to cure the country of its ills, they bleed and beat the country through their actions. No I suppose not literally, but if you look around, there is a country full of afflicted people here. “So you’ve seen our shame, our disgrace?” Those were the first words from an older gentleman wearing a sash along the parade route. It is carnival in Cabanas de Viriato, the ancestral home of Portuguese second world war hero Aristides de Sousa Mendes, and I’m walking alongside Francisco Antonio Campos, director of the local philharmonic. He sounds frustrated as he stares in any direction to avoid looking at theghastly abandoned mansion looming over us in the town square. 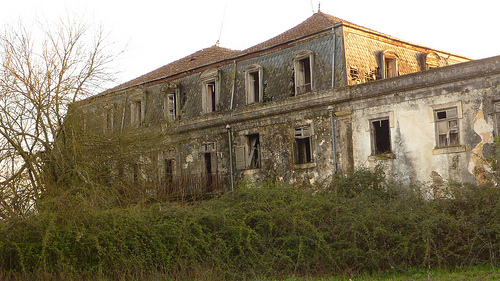 More than 70 years since Sousa Mendes, a diplomat assigned to the consulate in Bordeaux, saved over 30,000 people from the concentration camps of Nazi Germany, his story remains largely unknown and his majestic home, Casa do Passal, is falling to pieces. Casa do Passal, What is left of it. Note: For those in the NYC/Long Island area, there is a special event being put on by the Sousa Mendes Foundation on Saturday in Mineola. Full details here. The first messages came in via twitter, a confrontation between young protesters and police in Moldova.� Then, more clicking and a few more messages, live video feeds from Chisinau via Romanian television, reports of 1 young protester dead, 2 cops also killed. No confirmation.� Watching the video feed: scenes from the streets, sometimes just huge crowds standing around talking to each other, other time lines of riot gear police pushing back-and-forth against protestors.� Cut to the presidential palace, where the light exterior paint job has turned to a sllight shade of dirty, with many eggs and assorted garbage being thrown at the building.� More pushing, more police, more people from both sides falling out of the crowd clutching their bloody heads. Attention all who are concerned with voter fraud and/or New Jerseans: this video involves you.� IF you want your vote counted this election, you’re going to have to you absentee ballots. The voting computers they use throughout the state, especially those in Union County, have not met necessary requirements. Your vote may or may not count if you use them.� To quote the Joanne Rajoppi, Union County Clerk, “seriously consider” using absentee ballots. Watch this video for more details, YES it is out of sync.. my computer was doing too many things at once, time for a memory upgrade.